100% canx fees apply if canx within 14 days of travel. Cancellation fees can be applied to another booking within 12 months of original with a $50 per person fee. Groups of under 18s must be accompanied by one adult per 5 children. 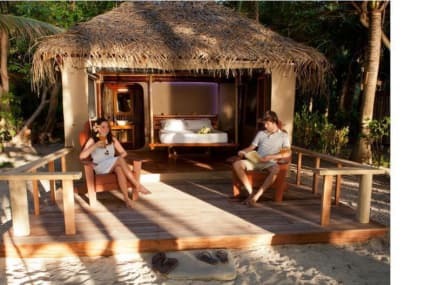 Far from the madding crowds and barely touched by the hand of man, all of the resort rooms are dotted along three unspoiled beaches, within walking distance of pristine coral reefs in protected marine parks. With visiting manta rays (seasonal May-Oct) as your neighbours and billions of stars overhead at night, you’ll be guaranteed some of the finest natural experiences that Fiji has to offer. Barefoot Manta Island lies on the secluded volcanic island of Drawaqa, in the Southern Yasawa Islands of Fiji. The stunning coral gardens right off any of the three beaches are some of the best in Fiji. Experience a new adventure every day! Swim with manta rays, snorkel, trek overland, visit islands and traditional villages, go fishing, or experience some of the best dive sites in the Yasawa Islands. Tick that bucket list off - if you have always wanted to dive but never had the chance. Now and here is the time to take this opportunity with our experienced dive crew . Each afternoon and into the evenings take part in sunset swims, volleyball matches, star-gazing, and nightly entertainment - all part of the fun! Barefoot Manta offers stunning coral gardens right off the beach where you can snorkel, kayak and swim with the local manta rays or spend a few lazy hours alternating between the hammock and lagoon. The resort offers a variety of clean, comfortable accommodation from twin-share waterfront bures (beach huts) built and thatched in traditional style, to deluxe 4 sleeper dorms. Showers and toilets are communal with cool fresh water. Our Beachfront Safari and Beachfront Family rooms have their own bathrooms. Linen is supplied. Please note that a mandatory resort package of FJ$105 per person, per night will be charged on the island. This includes 3 Pacific Island-style meals per day, Wi-Fi and non-motorised water sports equipment - excluding dive.